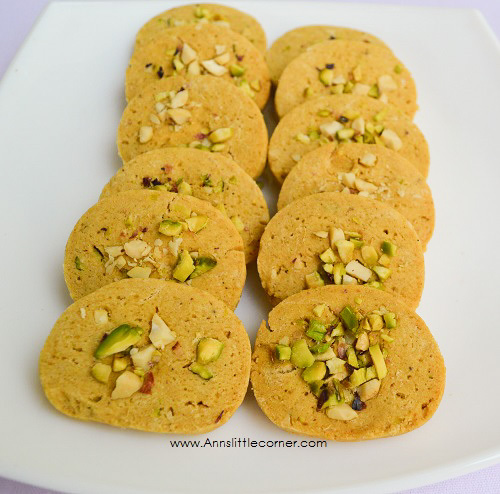 The Eggless Kaju Pista Cookies / Eggless Cashew Pistachio Cookies are one among the popular cookies in india. I have tried it with whole wheat flour. 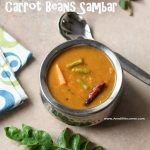 It is flavoured with Cardamom. Simply yumm. 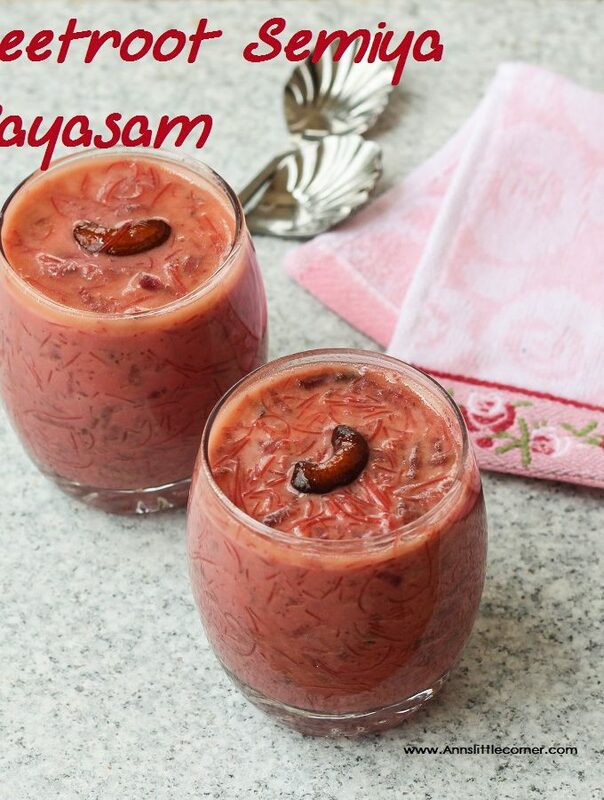 Addition of nuts gives in extra nutty flavour. It is a great snack with tea. It can also be packed as a gift. They have a creamy taste and crunchy texture. They tend to melt in the mouth when dipped in tea. 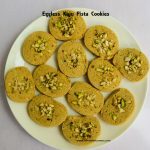 Eggless Kaju Pista Cookies / Eggless Cashew Pistachio Cookies are one among the popular cookies in india. Chop Cashew and Pistachios into tiny pieces. Add in the Whole wheat flour, Custard Powder, Powdered Sugar, Baking soda, Baking Powder and Cardamom powder and sift them few times to remove any lumps. Reserve one tablespoon of the chopped nuts and add the remaining nuts into the flour. Add in butter. Add in milk required add few teaspoons of milk. Knead the flour into a soft dough. Roll them like a cylinder. Roll the dough in a plastic wrap. Leave it in the refrigerator for 30 minutes. After 30 minutes remove them from the refrigerator. Remove the plastic wrap and chop them into thin slices. Get ready with your baking tray. Place the chopped cookies into the tray. Garnish with some chopped nuts on each cookies. Preheat the oven for 10 minutes at 180 Deg C. Place the baking tray into the oven. Bake for 20 minutes at 180 Deg C. Or when the sides starts darkening. 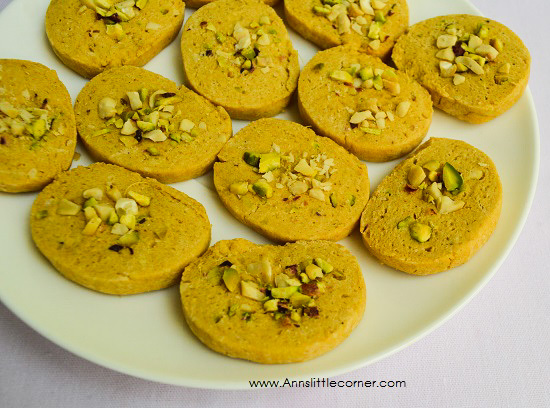 Nutty and Crunchy Kaju and Pista cookies are now ready to serve. The number of cookies depends on the size of cookies. The baking time differs from oven to oven. Adjust the baking time according to your oven. The baking time also depends on the thickness of the slices. The setting time in the refrigerator enables us to slice the dough easily or it is sticky and messy and does not hold any shape. 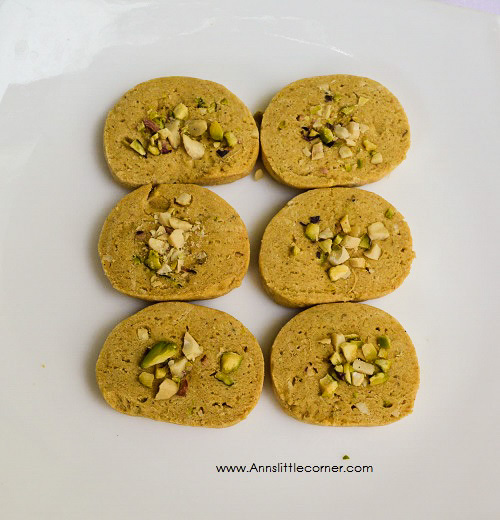 Adjust the sweetness of these cookies as per your taste. They are so fragrant and fills the house while baking. These cookies are over in minutes. Chop Cashew and Pista into tiny pieces. wow! cookies look so tempting! Very well made! !